Malcolm joined Everett Collins & Loosley as a manager in 1986 and became a partner 5 years later. He is the practice's resident IT expert, and clients frequently turn to him for advice on this subject, which to many is so perplexing and daunting. This expertise, which is also widely used in-house, gives ECL Howard Watson Smith a crucial edge in the ever growing and demanding world of modern communications. Away from the business Malcolm is an itinerant Baptist preacher and, when time allows, an enthusiastic cyclist. After qualifying as a Chartered Accountant in 1982, Martin joined Howard Watson Smith in 1986 and became a partner in 1989. In addition to providing a wide range of services to owner managed businesses, Martin is also a practising member of the Academy of Experts and has provided expert witness evidence on a variety of tax, accountancy and business valuation issues. Martin's spare time is divided between rock climbing with his wife and young daughter and racing in the Aston Martin Championship. The youngster of the partnership team, Darren joined Everett Collins & Loosley in 1997 as a manager and became a partner in 2003. His background makes him ideally suited to understanding the needs and problems of small to medium sized businesses, giving ECL Howard Watson Smith even more strength in this vitally important area. He is a Fellow of the Chartered Association of Certified Accountants. In his spare time Darren is an avid sportsman, representing Bedfordshire at badminton and playing tennis and cricket at club level. He recently represented England in the European over 35 badminton championships in Spain and reached the quarter finals. Barry joined Howard Watson in 1977 to form Howard Watson Smith which expanded to four partners in 1983. 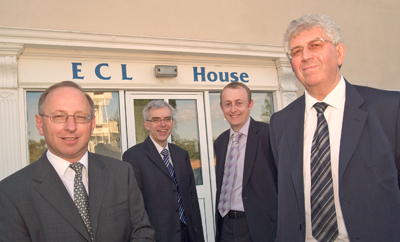 Barry became senior partner in 1989 following the retirement of his fellow founder partner and following on from the merger with Everett Collins & Loosley became the senior partner in ECL Howard Watson Smith before retiring himself on 31 March 2013. He is now an active consultant to the practice. Outside of work, he is a rugby enthusiast (although only as a spectator these days) and plays the tuba in a local brass band.